It doesn't just sit on a cliff but it has a stunning modern design too- inside and outside! Of course, if we talk about the views, we would always love to see the waters, the mountains or whatever view that is pleasing to the eyes. People prefer to live in places where they can get a good view of the surrounding which is of course a good thing. But it isn’t just the location that matters, but the design of the house itself. 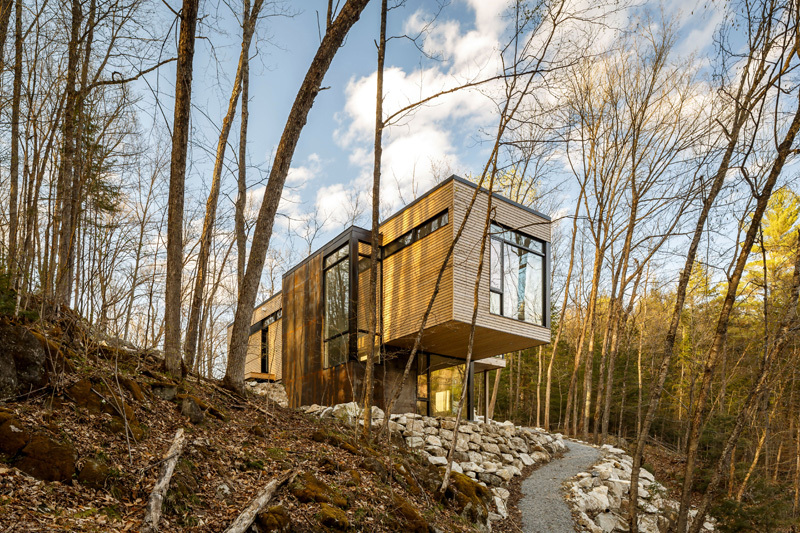 Have you seen cantilevered homes? I am sure you did. We have featured some homes with a design like this and I am certain that you love the overall look of the homes especially when it showcases different textures for the exterior and it has a cozy interior. A holiday homes is surrounded by woodlands in Val-des-Monts, Quebec, Canada. 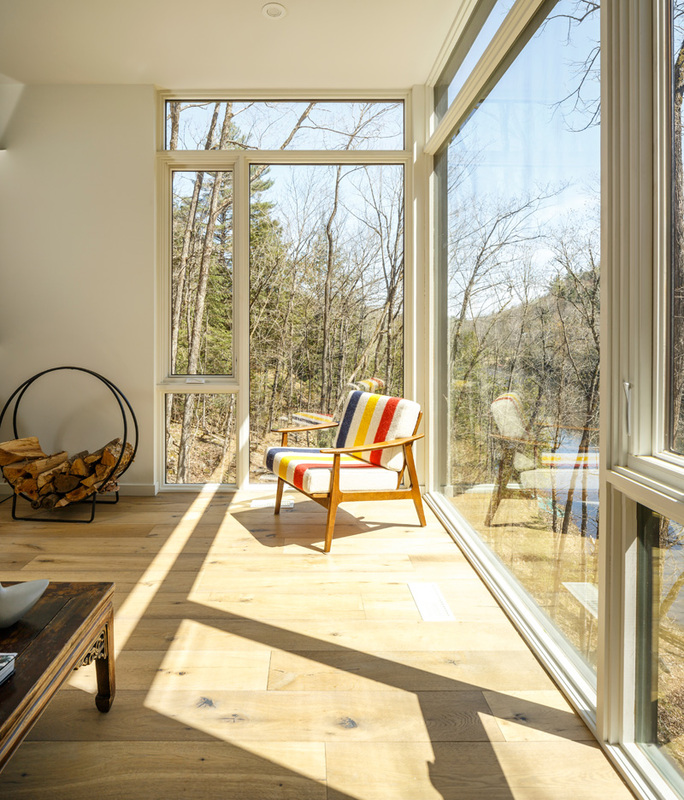 It is considered as a family cottage that sits on Gatineau hills and is way over the edge of a cliff to command views of the adjacent lake. 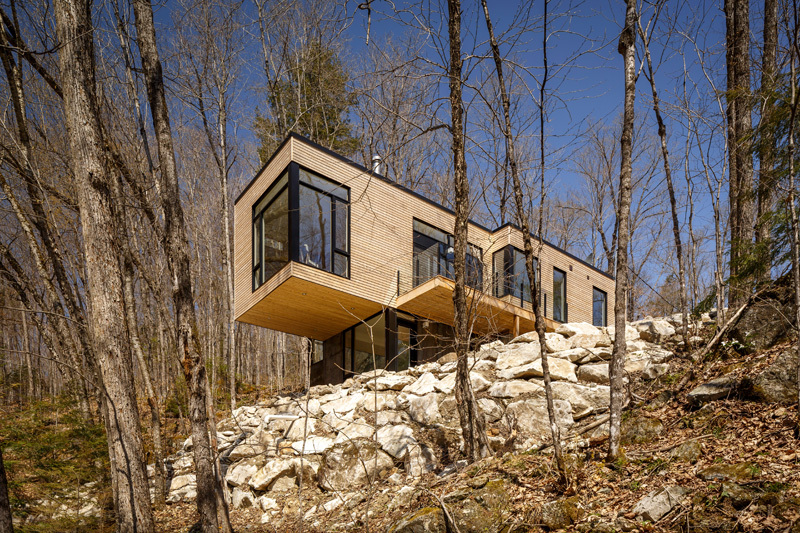 The sleeping quarters of this Canadian home are firmly set in the rock while the cantilevered family rooms slowly emerge from this stone base. 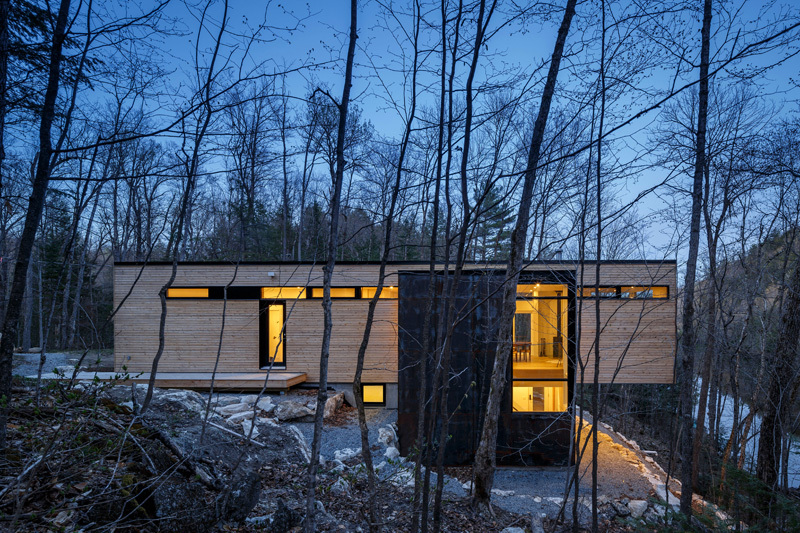 The entry of the home is visible from the road and leads to a tranquil path from the forest-side of the house and would move through the space opening up onto the lakeside. 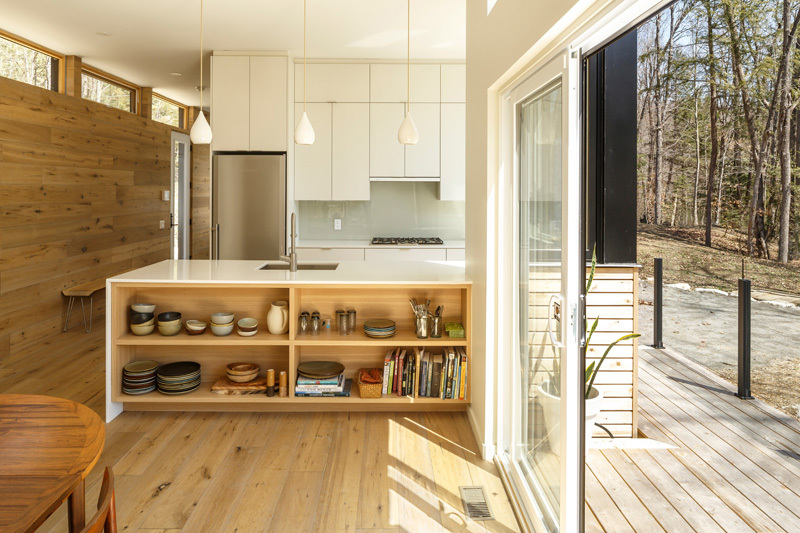 The design of the house is modern using white oak boards that wrap from wall to floor. This enhances the elongated shape of the house. The exterior cladding is composed of an open-joint eastern white cedar. Its stairwell is encased in steel. The cedar materials were left unfinished to age with the elements. The lower level contains a dormitory style sleeping quarters that are again embedded into the rock. The exterior can be accessed through a lower level recreation room which allows the family an easy admittance into nature. Cool air rising from the lake provides natural cooling into the home that goes through the lakeside openings and out through the clerestory windows on the forest elevation. Come take a look at this lovely home below. Unique feature: This house is considered a modern cottage that sits on a cliff and has a cantilevered area. The house has different volumes and geometric lines that completes its architecture. You can see here how a cantilevered area protrudes from the upper level and seemingly providing a shade on the entry area. I love how it looks like even from below. Seeing it is like inviting you come over! A clean walking path is also created to easily access the house. The other side of the house has a different look and is of course beautiful too. The windows are framed in black steel which adds more appeal to the space since it lines the area. Glass windows are also seen all throughout the house which provides natural light inside the home. The house sits near the edge of a cliff. This is an opportunity to get a good view of the forest area below. I can tell that with the sloped topography, it was very challenging to design the foundation of this house. Dramatic lights fill the home too from the exterior to the interior. On one side of the house, there is a black exterior wall which is made from weathered steel. It does look good with the wooden sidings and the black window frames and door jambs. 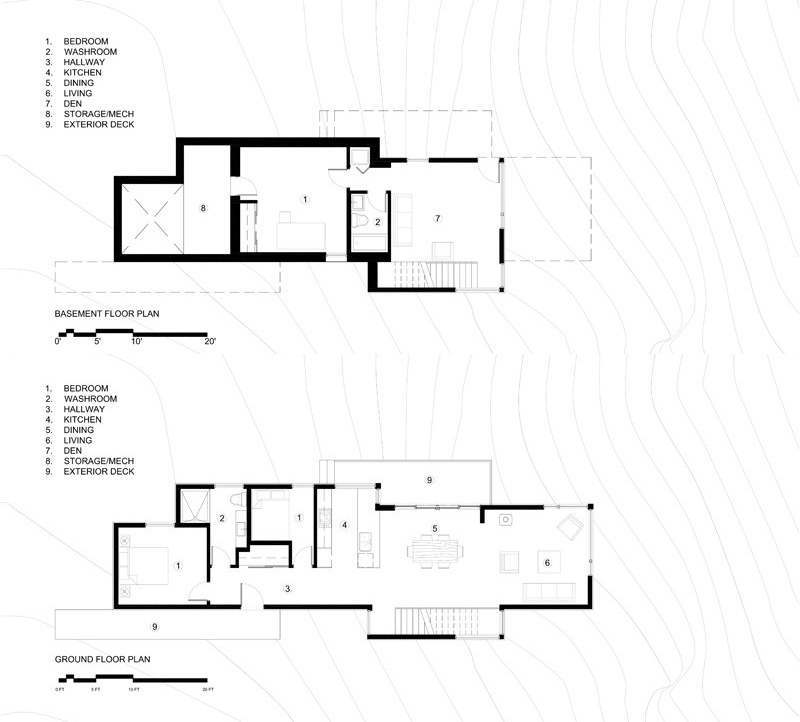 You can clearly see here that the house has variety of levels and volumes because of the sloping area. The interior has a relaxing feel. If you see black window frames outside, it is white from the inside. Wood is used in most areas of the interior. 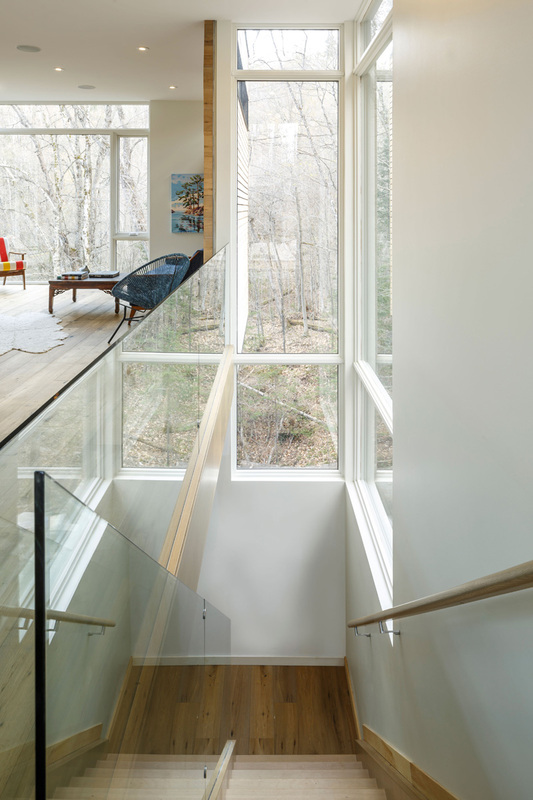 It also used stainless steel, glass and wood for the staircase that connects the different levels of the house. In this photo, we can get a glimpse of the living area that overlooks to the cliff. According to the designer, “the expanse of windows engages the ephemeral foliage from the treetops to the forest floor. The softness and shadows of the filtered forest light fosters an intimate relationship between the exterior and the interior.” That colorful striped chair is just lovely! I also find that firewood storage very creative. A porch is seen directly off the kitchen and dining area. White and wood is used mostly for the interior. Seen here are wooden walls and floors. The dining set is made from wood too while white pendant lights hang above the kitchen island. The kitchen has a picture window that gives a good view of the trees from outside. 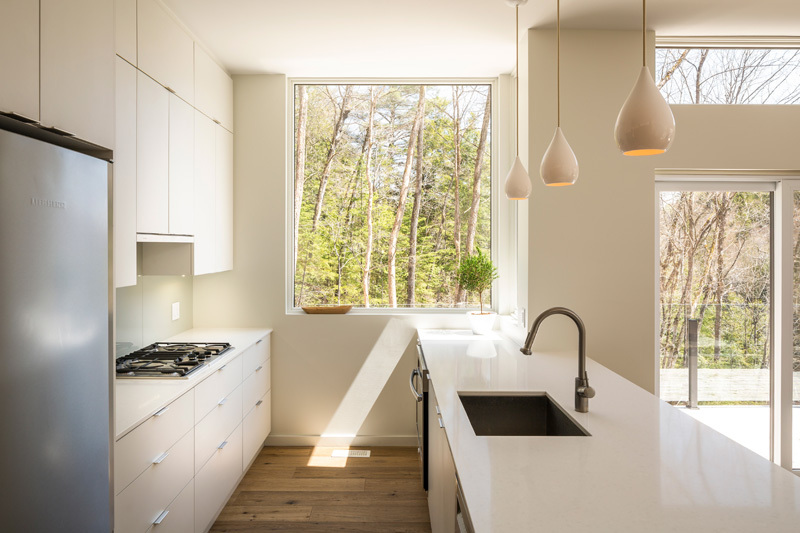 White is used for this kitchen which also has modern equipment, appliances and fixtures. The kitchen island is also a storage space since it has open shelving on one side which we saw on the previous photo and some cabinets on the other side. Isn’t this a lovely space? It sure is! 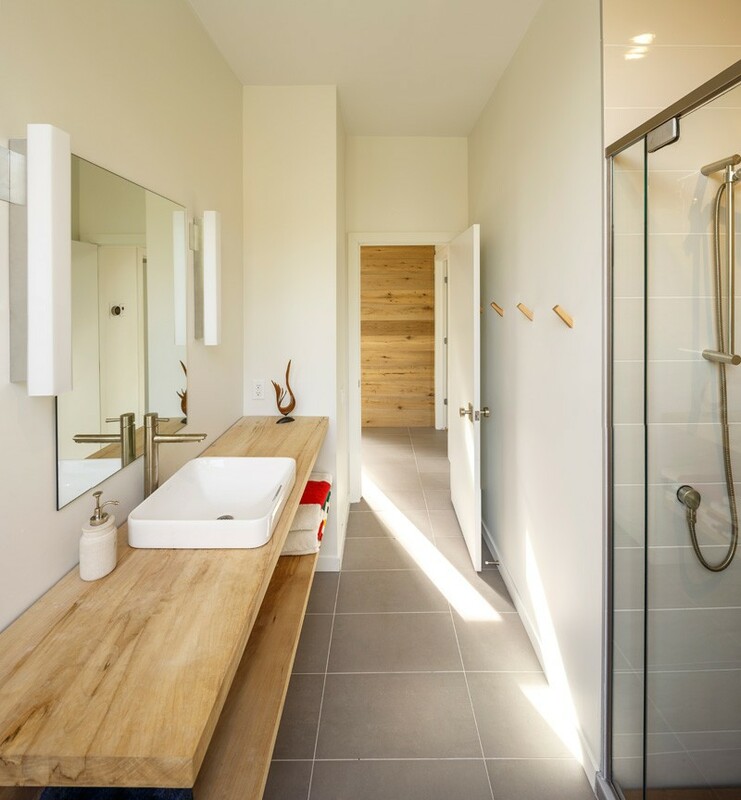 Slabs of silver maple create the bathroom vanity. Isn’t it beautiful? It sure is. The porcelain top-mount sink even adds beauty to the bathroom. The white walls create a lovely combination with the wooden elements in the space. It has a shower area too with glass enclosure. Meanwhile, it used light gray ceramic tiles for the flooring. Is this a bathroom you’d dream to own? Shown here is the floor plan of the basement and the ground floor where you can see how the different areas are distributed inside the house. This house that sits on the edge of a cliff is definitely a beauty! It is designed by Christopher Simmonds Architect who made sure that every area of the house will not just be aesthetically pleasing but will also be functional. First look at the exterior will already give us a hint that the house is indeed well-designed. It also gloriously integrates the beauty of nature into the design of the house while it literally sits around the stunning natural surroundings. Living in a place around trees would indeed be amazing. Picture windows inside the house also provide a good view of the trees around it. Hence, it was like being near to nature 24/7! Lovely, right? I know you want a home similar to this too, because who wouldn’t want one, anyway?